I have been pleased to receive your letter of 7 March, and interested to read your manuscript on a possible means of mapping complex molecular structures. 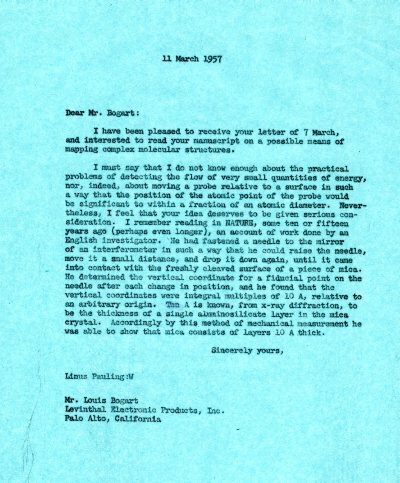 I must say that I do not know enough about the practical problems of detecting the flow of very small quantities of energy, nor, indeed, about moving a probe relative to a surface in such a way that the position of the atomic point of the probe would be significant to within a fraction of an atomic diameter. Nevertheless, I feel that your idea deserves to be given serious consideration. I remember reading in NATURE, some ten or fifteen years ago (perhaps even longer), an account of work done by an English investigator. He had fastened a needle to the mirror of an interferometer in such a way that he could raise the needle, move it a small distance, and drop it down again, until it came into contact with the freshly cleaved surface of a piece of mica. He determined the vertical coordinate for a fiducial point on the needle after each change in position, and he found that the vertical coordinates were integral multiples of 10 Å, relative to an arbitrary origin. Ten Å is known, from x-ray diffraction, to be the thickness of a single aluminosilicate layer in the mica crystal. Accordingly by this method of mechanical measurement he was able to show that mica consists of layers 10 Å thick.